Take a ride down memory lane for a moment: You’re pedaling on your Huffy bicycle. The trip seems harder. It’s more difficult to pedal. Oh, it’s your under-inflated tires. Sure, unless there’s absolutely no air in the tubes and you’re riding on the rims, you’ll get home. It’ll just take you longer and require more work. You get home, pump up the tires. Your rides are back to smooth. Now apply that same scenario to your vehicle. 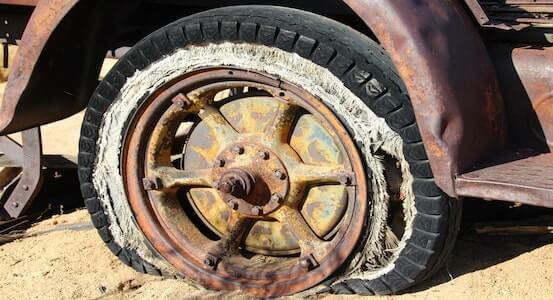 Under-inflated tires cost drivers time, fuel money, and wear and tear on the rest of the vehicle. Truck pulling to the left or right? Could be the steering is out of whack. The more likely—and more common—answer is that one or more of your tires are under-inflated. Under-inflated tires can impact tread wear by some 25%. Under-inflation by 10 PSI can reduce fuel economy by one percent. And then there’s over-inflation. That scenario can reduce traction and create a wear pattern that’s not in synch with the other tires. If air pressure is the problem, how about a tire with no air? Yes, that’s in the works, too: Bridgestone has developed the “Air Free Concept,” a tire that employs spokes instead of air. While the company has focused this on bicycles, we can readily see the same concept rolled out to larger vehicles. In the meantime, keep those tires inflated.